Eat Dallas: Off With the Boar's Head? 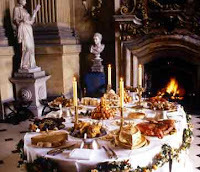 The phrase "eat like a king" takes on new (or old) meaning when referring to a typical feast at the table of Henry VIII. Tudors had no way of extending food life other than drying, smoking, salting, or pickling. It could not be transported, nor could it be frozen and therefore, fresh, in season produce and meats were relied upon. If you were like most people in the 1530s, poor, you would most likely have supped on pottage, a stew composed of meat or fish with herbs, vegetables, and grains which would have been served with bread and beer or wine if you were wealthy, as water could not be trusted, due to contamination. Potatoes were not introduced to Britain until Henry's daughter by Anne Boleyn, Elizabeth's reign. 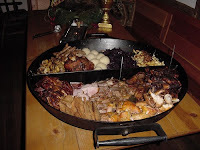 Typical meats of the period were oxen, deer, calves, pigs, wild boar, chickens, pheasant, dove, duck, and fish. These were either easily hunted or kept, so they were in steady supply. The large meats were either roasted, boiled, or made into pies, while the fish and poultry was baked, fries, grilled, or boiled. The food was usually serve in an herd sauce. In an average year the royal kitchen would serve 1,240 oxen, 8,200 sheep, 2,330, deer, 760 calves, 1,870 pigs, and 53 wild boar, totaling more than 14,000 large animals, equating to 23 animals per member of the court every year. 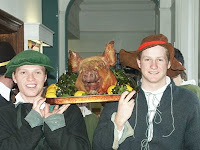 At the royal table the first course would have consisted of items such as Brawn (a terrine of meat from the head of a calf or pig, sometimes a sheep or cow, that may have also include meat from the feet and heart. It's usually eaten cold or at room temperature), Roast Tongue, Leg of Pork, Roast Beef, Roast Venison, Meat Pie, In Season Vegetables, and Bread. The second course would have contained Roast Lamb, Rabbit, Bread, Tarts, and Custard. Grilled Beaver Tail - This was popular on Fridays when Catholics were not allowed to eat meat as they categorized beavers as fish! Whale Meat - Whale meat was occasionally eaten on Fridays. Dolphin was also served. It was usually boiled or roasted. Spit-Roasted Meats - Wild boar or pig was served at almost every meal as a show of extreme wealth, as only the wealthy could afford fresh meat year round, and only the very wealthy could afford to roast it, due to the added fuel and labor cost. Whole Roasted Peacock - This was usually served baked, with its colorful feathers reapplied and its beak gilded in gold leaf. Black Pudding - This dish was popular in all parts of England. A sausage encased in pig intestine, it was made of boiled, congealed pigs blood. Internal organs - Not being ones to waste any part of an animal, medieval cooks served internal organs which were often considered delicacies. 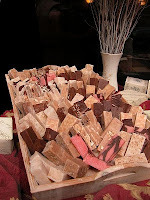 These were usually eaten fresh, but typical preservation methods were brining or storing in vinegar. The spleen, lungs, liver, and even udders were considered kingly fare. 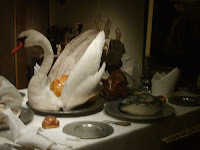 Roasted Swan - On very special occasions, swan was served, as it was considered too noble and majestic an animal to eat every day. The bird was usually presented with a gold crown atop its head. Still, English law dictates that all mute swans are owned by the Crown and can not be eaten without permission from the Queen. Boars Head - Garnished with bay leaf and rosemary, a boars head was often served as the centerpiece of the Christmas feast table, or for other special occasions. Vegetables - Veggies were not eaten in large quantities by the court as they were viewed as food of the poor. Vegetables comprised less than 20% of the royal diet. Marzipan - The deserts course was not popularized in England until the 1700s, when very elaborate sugar sculptures were popular among aristocrats. This paste made from ground almonds, sugar, and sometimes rose water, was occasionally served at the end of a meal. Spiced Fruitcake - During the Twelfth Night feast, which was on January 6th, a special cake containing a dried pea or bean was served. Whoever found the pea was crowned king or queen of the pea (or bean) and was treated as the guest of honor for the rest of the evening. Bread - Bread was served at every meal. Wine and Ale - Copious amounts of wine and ale were consumed to wash down all of that food. It is estimated that 600,000 gallons of ale (enough to fill an Olympic sized swimming pool) and 75,000 gallons of wine (1,500 bathtubs) were drunk every year at Hampton Court Palace.